An everlasting source of inspiration for your Art Journal is the set of symbols that mean something to you. Because even though their meaning may seem collective “property”, the experience can be very personal. A symbol is a strong visual incentive linking to a level of deep personal experience. We don’t carry or appropriate a symbol until some experience in life creates a strong connection with it deep down inside. It may seem somewhat challenging to use the symbol in your journal. In the first place it’s almost an in-your-face confession that the symboll is ‘yours’, which can be either empowering or make you feel a little bit vulnerable. And in the second place it may seem hard to make the symbol ‘yours’ because it may be widely used and therefore be so common that it may seem to have lost its meaning. Then bear in mind that for you it hasn’t lost its meaning at all; that for you the symbol can be a visual tool to connect with your inner thoughts and feelings really quickly, a simple tool that can take you to your authentic self, a visual sign of the growth or experience you have gone through. So think which symbols are yours, connect with them deep inside yourself and make a journal page about them, allowing yourself to open up to it and make the page genuine. An Art Journal is so safe a place that the only criticism you’re vulnerable to, is yours alone. But criticism will evaporate as soon as you genuinely open up to your symbols. If you feel the need to open up, but find it hard to express in images…use text to help you find your connection. 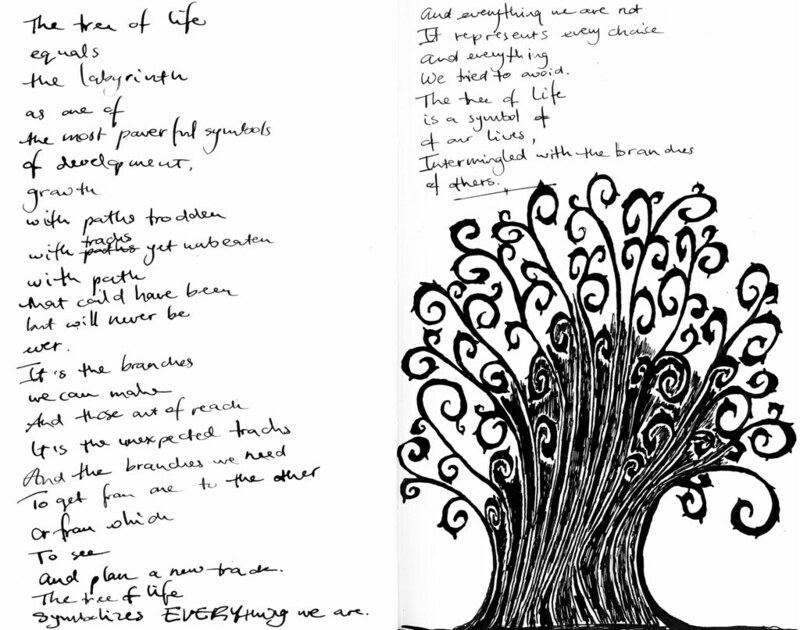 For a readable size of my Tree of Life, click here.